I have been wanting to try a pair of grey jeans for quite some time. This pair from Old Navy was on sale and a great price point to give them a try. The combination of grey and blush tones together are stunning. As soon as I saw this metallic side-stripe tank, I knew it was a match. By the way, it's on sale at J. Crew. Do you own grey jeans? I have some other ideas in mind for how I want to style these. Stay tuned! LOVE the look...and am so swooning over that RM bag!! I'm obsessed with the color blush, I never thought I would be especially after the bridesmaids dresses my step sister had in her wedding (no offense but the shade was totally wrong on everyones skin tone) ha. I absolutely love this blush bag & those earrings!!! Ugh so cute!!! 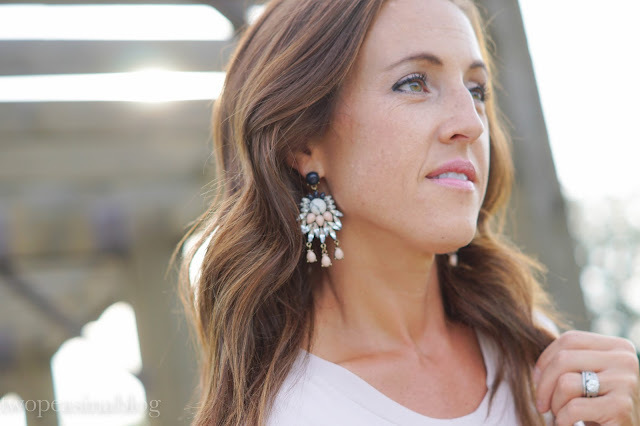 I've started to add more statement earrings to my closet instead of just little studs. What a fresh Summer look - love the bag!! gorgeous outfit - the color combo is really pretty! This is sooooocute! I need to get grey jeans. I love them! Such a fun look!!! I love the combo of grey and pink! I don't own grey jeans..but I do love that you paired blush and grey together! So, so pretty! I'm swooning over that beautiful blush bag! All of these neutrals in this look are so complimentary! I do love the grey jeans with the blush tones, so cute. I do have a pair of grey jeans, though I don't wear pants very often, I will definitely have to try them out with blush tones! Also your location looks gorgeous too!! I love how you are wearing blush with such a great ashy jean! I tend to wear it with black, dark wash denim, or white. I am going to have to invest in some grey pants now!! Thanks for hosting an amazing linkup! Happy wednesday! I love this soft, feminine look on you. And thanks for the link up... so fun! I love the blush tones! That shirt is so pretty! I love all of the soft colors in this outfit, speaking my language! I have grey jeans and I love them! They go with everything and you can seriously wear them year round, they're awesome! I don't have a blush top and I reallyyyyyy wish I did because they look perfect with grey jeans. 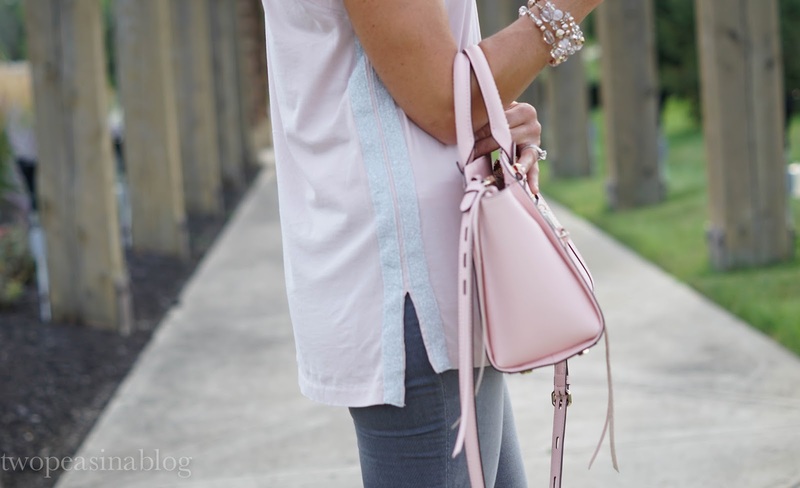 Beautiful blush color and so well paired with the grey jeans. I love those color combo. Grey plus blush is such a beautiful combination! So feminine and soft! You look beautiful and love that those jeans are such a steal! I love your blush colored look! Adding the color grey really compliments your look! I love your look! Gray jeans are one of my favorites and I wear them constantly, especially in the winter with black sweaters. Making a note to link up with you next week! Hi! I love this combo, so pretty and feminine with the pink and grey, lovely! Can I get a reminder about your linkup! That watch is perfect! It probably goes with everything I have in my closet! Oh katey you look stunning, I love the added baby pink handbag. Oh, those earrings and your bag are just beautiful! Love this outfit and view! Absolutely love this whole entire outfit!! LOVE it! very cute, I love the shoes with this color palette. 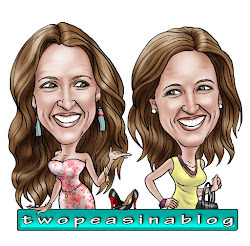 Do you have Bloglovin'?! Let's follow each other? Love this outfit from head to toe!! I am loving all things blush lately! wow, drooling over this bag! + the jeans look great! i had a pair of grey jeans as a teen and i should definitely get a pair, i wore those everywhere!